Unfortunately, the RT jailbreak tool doesn't work anymore for Windows 8.1. Is there any way to get the exe's (compiled for ARM) running via powershell? What you did here looks promising, but I don't understand what your c payload was... Can you could write the payload so that it launches an arbitrary exe (compiled for ARM)? Unfortunately, the technique I came up with doesn't work in 8.1. Also, like I said, I can't discuss that technique right now. All I did in my post was offer up a PoC ARM shellcode payload. A means to execute the payload is up to you. It was not my goal in the post to describe a Windows 8.1 jailbreak. M platform is not supported. Just remove that line from crtdefs.h and then you can compile your code. Why can't you discuss it? Other people talk about exploits against Microsoft code all the time. Do you have some sort of contractual relationship with them? I'm just curious because I'm not discussing mine, either. I'm not discussing how I did it as a strategic decision, not because I can't. I can't discuss it right now because I'm going through the coordinated disclosure process with Microsoft. As soon as Microsoft closes the ticket, trust me, I'll be sure to blog about the technique. You probably wouldn't find it too impressive though considering it's only a UMCI bypass (i.e. not a full-fledged jailbreak). I like it though because it unlocks PowerShell and as a PS fanboy, that's mostly all I need. It annoys me the effort they went to just to lock down WindowsRT and PS specifically for something they then don't consider a security issue. Then again if it isn't a security issue why does it get fixed in 8.1? I understand Microsoft's attempts to lock down PowerShell as it is installed by default on all Windows machines and poses such a powerful post-exploitation environment. I really don't understand the logic to lock down WinRT though. Considering it cannot be domain joined, no enterprise in their right mind would want to purchase them. It was designed to be a consumer device and what do consumers want? Control! Perhaps MS would get more sales of WinRT tablets if they just unlocked the damn OS. Either way, I'm OK with the state we're in. I enjoy finding UMCI bypasses. Nope. Mine is different. Mine involves flicking a few bit to get around Constrained Language mode. Well, the other issue was in the Import-PSWorkflow command which is implemented in Microsoft.PowerShell.Workflow.ServiceCore assembly. Most of the workflow stuff doesn't work and loading the workflow module errors with missing assemblies. But if you copy that assembly to your documents folder as a private module you can load it. From there you can execute non-compiled XAML workflow (there are two forms, one which gets compiled, bad, and one which is interpreted, good), which basically allows you to execute arbitrary .NET functions and capture the results. From that you can bootstrap the assembly loading trick. Simple ;) Hopefully the PoC wasn't mangled by posting it. I got a similar reply years ago when I reported a memory overwrite exploit that csrss.exe could use to escalate to kernel mode in Vista, allowing bypassing driver signing. They didn't see it as a problem. And yet, in Windows 8.1, they made csrss.exe a protected process just so that you couldn't do attacks against win32k's lax protection of csrss parameters. Microsoft security people can be quite inconsistent sometimes. A related, but not exactly on-topic question... I'm trying to build a VS2012 WinRT project with an ARM asm file as part of the project's source. The compile part of the build shows no errors, but ARMASM is never run on the file. When it tries to link, it complains that the obj file for my asm code is not found. My x86/x64 builds of the project both work fine with external asm files. Is there some trick to get VS2012 to properly compile and link ARM asm modules? 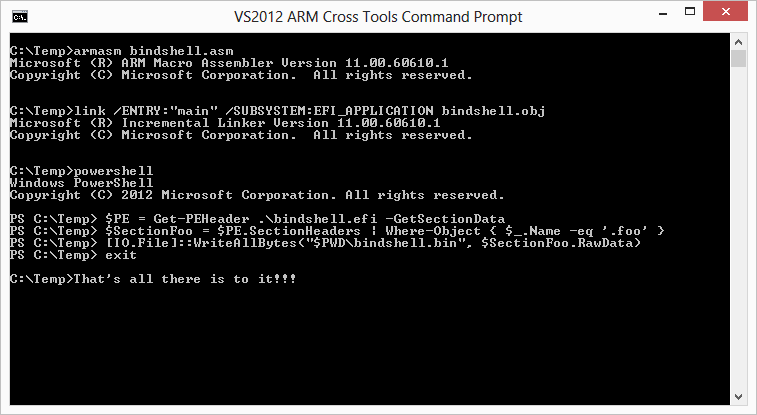 1) Assemble your ARM asm file as a pre-build or pre-link step. Go to - Project Properties->Configuration Properties->Build Events->Pre-Build Event. Add the armasm command-line options there. That will output the object file. 2) Add the object file as a dependency for the linker: Project Properties->Configuration Properties->Linker->Input->Additional Dependencies. Add the path to your object file there. You'll find a decent example of this configuration in the x64 configuration of my PIC_Bindshell project - https://github.com/mattifestation/PIC_Bindshell. Obviously, just replace the ml64 options with your armasm options.